New models include functionality to transmit 4K x 2K Ultra High Definition signals up to 328 ft and use Cat5e/6/6a cables, support for 10/100 Ethernet and Power over Cable. Tripp Lite, a world-leading manufacturer of power protection and connectivity solutions, has expanded its line of HDBaseT audio/video extender products. The new models include functionality to transmit 4K x 2K Ultra High Definition (UHD) signals up to 328 ft. using widely available Cat5e/6/6a cables, support for 10/100 Ethernet and Power over Cable (PoC). 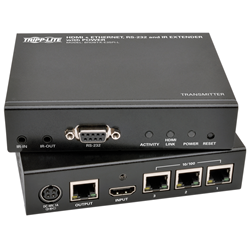 These new items join Tripp Lite’s existing line-up of HDBaseT extenders that support HDMI, Serial and IR transmissions. Using HDBaseT technology to transmit uncompressed digital audio and video over a single cable, these models help reduce cable clutter and create a cost-effective solution for transmitting signals to digital signage, multimedia displays and home theater installations. The products also support Power over Cable functionality, requiring a power source only at the transmitter end of the installation, providing more flexibility in receiver placement. To complement Tripp Lite’s existing 4 x 2 matrix transmitter, the line extension also includes a 4 x 4 matrix model, which allows the user to share HDMI digital video from four components to four different monitors at resolutions up to 3840 x 2160 at 30 Hz. Support the addition of multiple HDBaseT transceivers to enable a UHD 4K signal to be extended up to 2,000 ft.
For more information on the new HDBaseT products, visit: Tripp Lite HDBaseT Audio/Video Extender Solutions. Outstanding product reliability and exceptional service have been Tripp Lite trademarks for over 90 years. Tripp Lite´s innovations include the world’s first UPS system designed specifically for personal computers and the world’s most trusted premium surge protector—the Isobar®—with more than 19 million in use. Tripp Lite maintains the highest level of ready-to-ship inventory in the industry with more than 3,500 different products, including UPS systems, rack systems and cooling solutions, PDUs, PowerAlert software for enterprise-level system management and control, surge protectors, KVM switches, cables and connectivity products, inverters, power strips and notebook accessories. Headquartered in Chicago, Illinois, Tripp Lite maintains a global presence with fully staffed offices worldwide. Additional information, including a list of Tripp Lite’s sales offices and authorized reseller partners, can be found by visiting Tripp Lite’s website: http://www.tripplite.com.